In Bronco Mendenhall’s first season as Virginia head coach, sophomore Myles Robinson played in four games, earning three starts at cornerback before suffering a “lower extremity” injury in the Cavaliers’ fourth game against Central Michigan. The injury required surgery and the former Good Counsel (Olney, MD) standout was sidelined for the remainder of the season. Although his 2016 season ended prematurely, Robinson showed promise, totaling 9 tackles (6 solo) and 2 pass breakups. 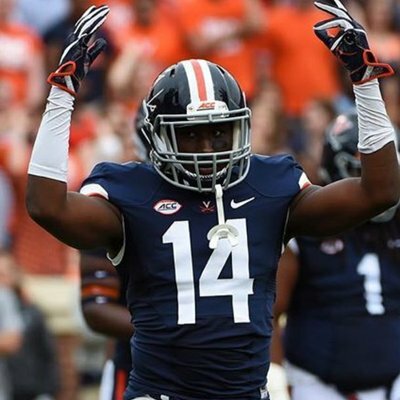 He was not enrolled during the 2017/2018 school year, but the 5’11”, 195-pound defensive back has returned to UVA and is once again a member of the Cavalier football team. He seems focused to try and carve out a significant role on Mendenhall’s defense in 2018. Despite the departure of All-American safety Quin Blanding, Virginia returns quite a bit of experience and talent in the secondary. 2017 All ACC third team selection Juan Thornhill, a rising senior, has accumulated 23 starts the past two seasons. Junior cornerback Bryce Hall started 20 games his freshman and sophomore seasons combined. Safety Brenton Nelson started all 13 games as a redshirt freshman last season, earning ACC Defensive Rookie of the Year honors for his performance. Cornerback Tim Harris played in only three games the past two seasons combined because of injury; however, he was granted a sixth year of eligibility and returns with 21 games of starting experience. Sophomore safety Joey Blount and redshirt freshman cornerback Germane Crowell are among the other talented defensive backs returning for the Hoos in 2018. Robinson’s return, though, could be significant for the next two seasons. Cornerbacks Harris and Crowell have been plagued by injuries, while safeties Nelson and Blount were sidelined this spring with injuries. Robinson provides needed depth and experience at both positions. He could garner serious consideration as Virginia’s nickel back this season, too. Looking ahead to 2019, the Hoos will have lost Thornhill and Harris. A good 2018 campaign and Hall could declare for the 2019 NFL Draft. Robinson could be in line to grab a starting spot somewhere in the secondary as a fifth-year senior.